Chelsea Green Publishing Company, 9781603586481, 656pp. 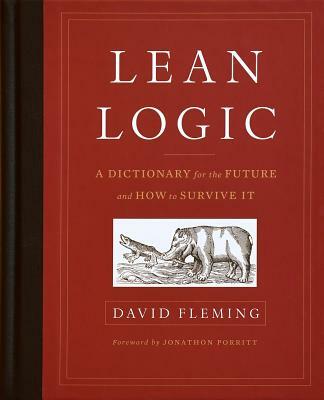 Lean Logic is David Fleming's masterpiece, the product of more than thirty years' work and a testament to the creative brilliance of one of Britain's most important intellectuals. A dictionary unlike any other, it leads readers through Fleming's stimulating exploration of fields as diverse as culture, history, science, art, logic, ethics, myth, economics, and anthropology, being made up of four hundred and four engaging essay-entries covering topics such as Boredom, Community, Debt, Growth, Harmless Lunatics, Land, Lean Thinking, Nanotechnology, Play, Religion, Spirit, Trust, and Utopia. The threads running through every entry are Fleming's deft and original analysis of how our present market-based economy is destroying the very foundations--ecological, economic, and cultural-- on which it depends, and his core focus: a compelling, grounded vision for a cohesive society that might weather the consequences. A society that provides a satisfying, culturally-rich context for lives well lived, in an economy not reliant on the impossible promise of eternal economic growth. A society worth living in. Worth fighting for. Worth contributing to. The beauty of the dictionary format is that it allows Fleming to draw connections without detracting from his in-depth exploration of each topic. Each entry carries intriguing links to other entries, inviting the enchanted reader to break free of the imposed order of a conventional book, starting where she will and following the links in the order of her choosing. In combination with Fleming's refreshing writing style and good-natured humor, it also creates a book perfectly suited to dipping in and out. The decades Fleming spent honing his life's work are evident in the lightness and mastery with which Lean Logic draws on an incredible wealth of cultural and historical learning--from Whitman to Whitefield, Dickens to Daly, Kropotkin to Kafka, Keats to Kuhn, Oakeshott to Ostrom, Jung to Jensen, Machiavelli to Mumford, Mauss to Mandelbrot, Leopold to Lakatos, Polanyi to Putnam, Nietzsche to N ss, Keynes to Kumar, Scruton to Shiva, Thoreau to Toynbee, Rabelais to Rogers, Shakespeare to Schumacher, Locke to Lovelock, Homer to Homer-Dixon--in demonstrating that many of the principles it commends have a track-record of success long pre-dating our current society. Fleming acknowledges, with honesty, the challenges ahead, but rather than inducing despair, Lean Logic is rare in its ability to inspire optimism in the creativity and intelligence of humans to nurse our ecology back to health; to rediscover the importance of place and play, of reciprocity and resilience, and of community and culture. Recognizing that Lean Logic's sheer size and unusual structure could be daunting, Fleming's long-time collaborator Shaun Chamberlin has also selected and edited one of the potential pathways through the dictionary to create a second, stand-alone volume, Surviving the Future: Culture, Carnival and Capital in the Aftermath of the Market Economy. The content, rare insights, and uniquely enjoyable writing style remain Fleming's, but presented at a more accessible paperback-length and in conventional read-it-front-to-back format.